Bill and Hillary Clinton on Monday announced they will embark on a 13-city speaking tour shortly after November's midterm elections, with tickets running as high as $745 a piece. It is difficult to believe but there is some speculation that the tour will set the stage for yet another Hillary presidential run. The tour, which kicks off in Las Vegas, is set to run from November 2018 to May 2019. 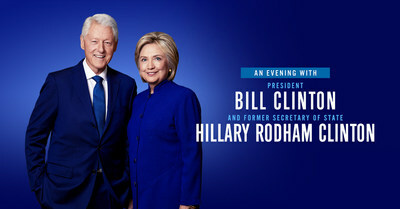 The events, produced by Live Nation, are titled "An Evening with President Bill Clinton and former Secretary of State Hillary Rodham Clinton"
No. she has no money. she burnt a too many of her contributors last time.